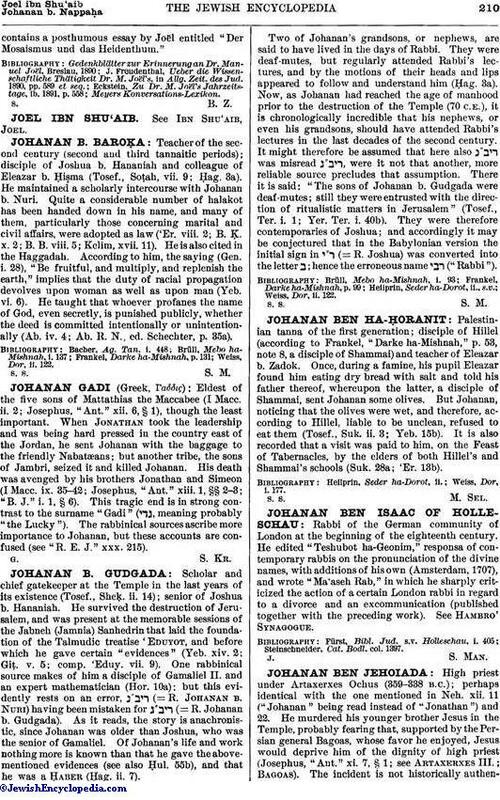 Palestinian tanna of the first generation; disciple of Hillel (according to Frankel, "Darke ha-Mishnah," p. 53, note 8, a disciple of Shammai) and teacher of Eleazar b. Zadok. Once, during a famine, his pupil Eleazar found him eating dry bread with salt and told his father thereof, whereupon the latter, a disciple of Shammai, sent Johanan some olives. But Johanan, noticing that the olives were wet, and therefore, according to Hillel, liable to be unclean, refused to eat them (Tosef., Suk. ii. 3; Yeb. 15b). It is also recorded that a visit was paid to him, on the Feast of Tabernacles, by the elders of both Hillel's and Shammai's schools (Suk. 28a; 'Er. 13b).